Baked in the oven chicken is a delicious, nutritious and at the same time healthy dish. And that the meat in the end turned out especially tender and aromatic, it is better to hold in the marinade. The latter can be prepared from a variety of products – from mayonnaise to sweet juice. - salt and black pepper to taste. Washed and dried the chicken salt and pepper both outside and inside. In a separate bowl, mix the mayonnaise with sour cream, add passed through the press garlic and mix again. RUB the chicken outside of the cooked marinade and leave at room temperature for an hour. Then put in preheated oven and bake until tender. - 100 ml pineapple juice. Pineapple juice in this recipe can be replaced by orange. But it needs to be natural, otherwise the taste will be spoiled. Mix liquid ingredients in a separate bowl and heat. Add sugar and chopped garlic. Let the marinade infuse and cool to room temperature. Chicken, cut into serving pieces, season with a little salt and fold stainless cookware. Pour meat marinade, cover with flat plate, on which put some load. Put the chicken in the refrigerator and soak in the marinade for at least 3 hours, occasionally turning the pieces. Then bake in the usual way. Before you put any meat in the oven, it should stand at room temperature for at least 20 minutes – then it will be tastier and more tender. - 1 teaspoon of ground red pepper. The honey in this marinade it is better to use liquid. Heavily sugared product you need at first a little bit to melt in a water bath, but do not bring to a boil. Chicken wash, dry and cut into large pieces. Garlic peel and chop, put it in a bowl and add the remaining marinade ingredients. Mix everything thoroughly and then dip it in the prepared marinade each piece of meat. 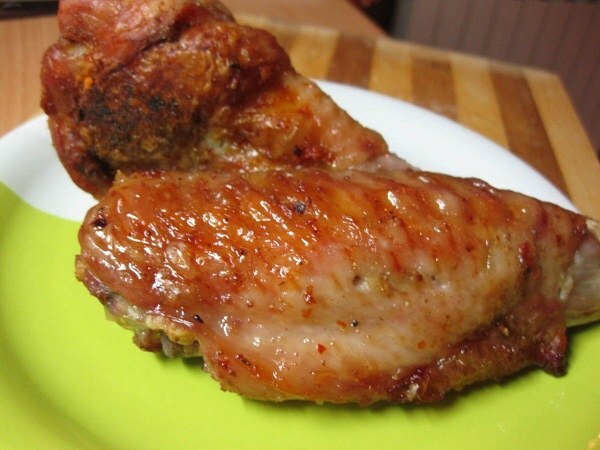 Fold the chicken in a deep plate, pour the leftover marinade, cover and leave for 1-2 hours at room temperature. Then place on a baking sheet and bake in a preheated oven at a temperature of 200oC. During baking the chicken be sure to pour the released juice. 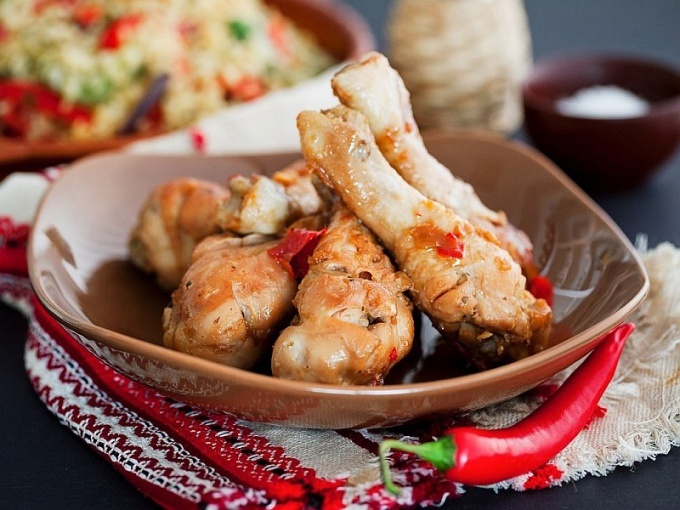 To cook delicious, flavorful and tender chicken dish, pre-meat needs to marinate and infuse. Offered the options of marinade will meet all your expectations. Thoroughly combine all ingredients. The marinade should be thick consistency. Each chicken slice with a sharp knife along the backbone into two parts. Thoroughly wash the meat in cold water and blot with a clean paper towel. Then from all sides of the grate halves of the chicken marinade, place in a plastic bag, close tightly, place in refrigerator and leave for 8-10 hours. Then soak the meat for about 2-3 hours at room temperature. Cook chicken on grill until cooked, turning occasionally and oiling with the remaining marinade. The chicken with a sharp knife cut in half along the sternum and spine. Wash thoroughly in cold water and dry. To prepare the marinade, combine the wine, 2 tablespoons of olive oil, ginger, chopped garlic, pepper and salt. Put the meat into a deep saucepan and add ginger-garlic marinade. Leave at room temperature for 3-4 hours. Then take out half of the chicken, brush the remaining olive oil, place on a baking sheet and place in preheated 200 degree oven. Bake for 1-1.5 hours. Chicken in a yoghurt marinade with spices "in Arabic"
Each chicken cut into 2-4 pieces, wash, dry, put it in a bag and lightly beat off. Prepare the marinade: grate the onion on a grater, chili very finely chop, garlic chop, add yogurt, olive oil, vinegar, salt and mix. Put in the marinade chicken and leave for 4-5 hours. 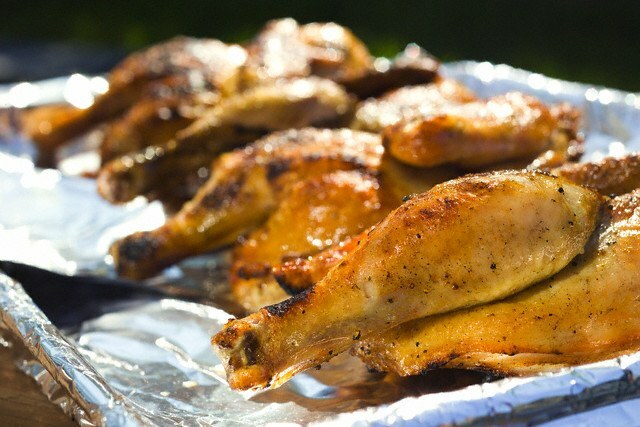 Ready marinated chicken along with the marinade, place on a baking tray lined with foil. Cook at 200 degrees, cover the meat with foil for 40-50 minutes. Then remove the foil and bake until Golden brown. Baked chicken is a delicious and hearty dish. It is good in itself, and with many kinds of side dishes such as rice, potatoes. But the meat will be tastier and juicier if it is pre-marinated. Mix in a bowl or saucepan the following ingredients: sour cream, red pepper (paprika) juice of half a lemon or lime, 2-3 cloves of garlic and salt. Put in this mixture pieces of chicken, stir and soak in the refrigerator for at least an hour. Then put the marinated meat on a greased baking sheet, place it in a hot oven. Mix 2-3 tablespoons of sour cream with the same amount of vegetable oil. Add the juice of half a lemon or lime, a little mustard, about 1 teaspoon of orange or pomegranate syrup, salt, pepper and a little herbs to taste (marjoram, oregano). Might as well add thyme (thyme), but it should be more careful, since the characteristic pungent odour of its main aromatic component of not everyone likes. This mixture, coat pieces of chicken or whole carcass. Put in the refrigerator for at least an hour. Then put the meat on a baking sheet and place in preheated oven. Mix 3-4 tablespoons of liquid honey (acacia, lime, or herb) with soy sauce. Add a little ketchup, two cloves of garlic, pepper and a little salt. In this mixture put the pieces of chicken. Mix well and refrigerate for a day. The longer the marinate the chicken the tastier and more tender it will be released. Lay the meat on a baking sheet mix the vegetables, for example, big pieces of potatoes, carrots. Bake, occasionally basting segregated juice. The combination of sweetness of honey with spiciness of garlic and soy sauce will give a unique taste. If you don't like soy sauce, you can add it to honey in a small amount. Buckwheat honey in this marinade should not be used since the taste will be worse.